This article is about the administrative region and county. It is not to be confused with conurbation, known as the Greater London Built-up Area. For other uses, see London (disambiguation). The county of Greater London was created on 1 April 1965 through the London Government Act 1963. Administratively, Greater London was first established as a sui generis council area under the Greater London Council between 1963 and 1986. 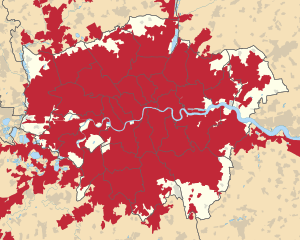 The area was re-established as a region in 1994, and the Greater London Authority formed in 2000. The region covers 1,572 km2 (607 sq mi) and had a population of 8,174,000 at the 2011 census. It has the highest GVA per capita in the United Kingdom at £37,232. The Greater London Built-up Area—used in some national statistics—is a measure of the continuous urban area of London, and therefore includes areas outside of the administrative region. The term Greater London has been and still is used to describe different areas in governance, statistics, history and common parlance. In terms of ceremonial counties, London is still divided into the small City of London and the much wider Greater London. This arrangement has come about because as the area of London grew and absorbed neighbouring settlements, a series of administrative reforms did not amalgamate the City of London with the surrounding metropolitan area, and its unique political structure was retained. Outside the limited boundaries of the City, a variety of arrangements has governed the wider area since 1855, culminating in the creation of the Greater London administrative area in 1965. Although the London County Council was created covering the County of London in 1889, the county did not cover all the built-up area, particularly West Ham and East Ham, and many of the LCC housing projects, including the vast Becontree Estates, were outside its boundaries. The LCC pressed for an alteration in its boundaries soon after the end of the First World War, noting that within the Metropolitan and City Police Districts there were 122 housing authorities. A Royal Commission on London Government was set up to consider the issue. The LCC proposed a vast new area for Greater London, with a boundary somewhere between the Metropolitan Police District and the home counties. Protests were made at the possibility of including Windsor, Slough and Eton in the authority. The Commission made its report in 1923, rejecting the LCC's scheme. Two minority reports favoured change beyond the amalgamation of smaller urban districts, including both smaller borough councils and a central authority for strategic functions. The London Traffic Act 1924 was a result of the Commission. Reform of local government in the County of London and its environs was next considered by the Royal Commission on Local Government in Greater London chaired by Sir Edwin Herbert which issued the 'Herbert Report' after three years of work in 1960. The commission applied three tests to decide if a community should form part of Greater London: how strong is the area as an independent centre in its own right; how strong are its ties to London; and how strongly is it drawn outwards towards the country rather than inwards towards London. Greater London continues to include the most closely associated parts of the Greater London Urban Area and their historic buffers. Thus it includes, in five boroughs, significant parts of the Metropolitan Green Belt which protects designated greenfield land in a similar way to the city's parks. The closest and furthest boundaries are with Essex: between Sewardstonebury next to Epping Forest and Chingford and with the Mar Dyke between Bulphan and North Ockendon, overall it borders London to the north east. Greater London is bounded by the other home counties: Hertfordshire to the north, Berkshire and Buckinghamshire to the west, Kent to the south east and Surrey to the south and south west. The highest point is Westerham Heights, in the North Downs and on the boundary with Kent, at 245 metres (804 ft). Central government has implemented small boundary changes. The greatest were the 1969 transfers of Farleigh to Surrey and Knockholt to Kent. Others have included exchange of two Thames islands with Surrey and adjustments during the 1990s to parts of the boundaries of three boroughs near the M25 motorway. 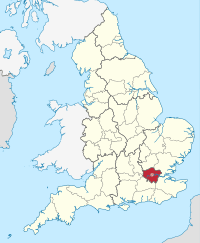 The only part of Greater London outside this motorway ring is North Ockendon, the furthest land unit from its centre. 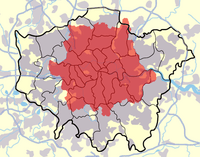 The majority of Greater London forms the London low emission zone, effective from 4 February 2008. With increasing industrialisation, London's population grew rapidly throughout the 19th and early 20th centuries, and it was the most populated city in the world until overtaken by New York in 1925. 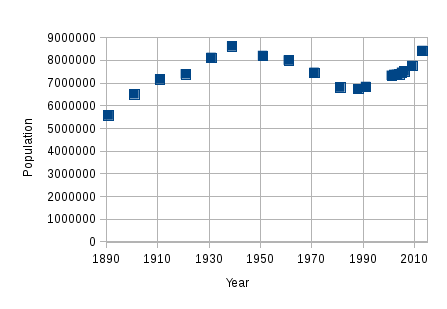 Its population peaked at 8,615,245 in 1939. There were an estimated 7,753,600 official residents in mid-2009. London's continuous urban area extends beyond the borders of Greater London and was home to an estimated 9,332,000 people in 2005, while its wider metropolitan area has a population of between 12 and 14 million depending on the definition of that area. According to Eurostat, London has been the most populous city and metropolitan area of the European Union. In the 2001 census, 71.15% of the population classed their ethnic group as white, including White British (59.79%), White Irish (3.07%) or "Other White" (8.29%, mostly Greek-Cypriot, Italian, Polish and Portuguese). 12.09% classed themselves as British Asian, including Indian, Pakistani, Bangladeshi and "Other Asian" (mostly Sri Lankan, Arab and other Southern Asian ethnicities). 10.91% classed themselves as Black British (around 6% as Black African, 4% as Black Caribbean, 0.84% as "Other Black"). 3.15% were of mixed race; 1.12% as Chinese; and 1.58% as other (mostly Filipino, Japanese, Korean, Vietnamese and other "British Orientals"). 21.8% of inhabitants were born outside the European Union. The Irish, from both the Republic of Ireland and Northern Ireland, number about 200,000, as do the Scots and Welsh combined. In January 2005, a survey of London's ethnic and religious diversity claimed that there were more than 300 languages spoken and more than 50 non-indigenous communities with a population of more than 10,000. Figures from the Office for National Statistics show that in 2006 London's foreign-born population was 2,288,000 (31%), up from 1,630,000 in 1997. The 2001 census showed that 27.1% of the population were born outside the UK, and a slightly higher proportion were classed as non-white. In the 2011 census, 59.79% of the population classed their ethnic group as white, including White British (44.89%), White Irish (2.15%) or "Other White" (12.65%, mostly Greek-Cypriot, Italian, Polish, Spanish, Colombians and Portuguese). 18.49% classed themselves as British Asian, including Indian, Pakistani, Bangladeshi and "Other Asian" (mostly Sri Lankan, Arab and other Southern Asian ethnicities). 13.32% classed themselves as Black British (7% as Black African, 4.22% as Black Caribbean, 2.08% as "Other Black"). 4.96% were of mixed race; and 3.44% as other (mostly Filipino, Japanese, Korean, Vietnamese and other "British Orientals"). The table shows the top 21 countries of birth of residents in 2011, the date of the last UK Census. These figures do not give a fair indication of the total population of the specific ethnic groups associated with each country. For example, Londoners of Greek origin (from both Greece and Cyprus) number 300,000, since an organised Greek community has been established for nearly two centuries. The same can be said for Italian and French Londoners whose communities have been here for centuries (the French Embassy estimates there are between 300,000 and 400,000 French citizens living in the UK, with "a huge majority of them living in London"). Though a Polish community has existed in London since the late Middle Ages, it was not significant in the 2001 census but has grown significantly since 2004 and by June 2010 London had 122,000 Polish residents. The German-born population figure may be misleading, however, because it includes British nationals born to parents serving in the British armed forces in Germany. London has been a focus for immigration for centuries, whether as a place of safety or for economic reasons. Huguenots, eastern European Jews, Cypriots and East African Asians are examples of the former; Irish, Bangladeshis and West Indians came for new lives. The East End district around Spitalfields has been first home for several ethnic groups, which have subsequently moved elsewhere in London as they gained prosperity. The population of the current area of Greater London rose from about 1.1 million in 1801 (when only about 850,000 people were in the urban area, while 250,000 were living in villages and towns not yet part of London) to an estimated 8.6 million in 1939, but declined to 6.7 million in 1988, before starting to rebound in the 1990s. By 2006, the population had recovered to the level of 1970 (and the level of population in the 1920s). It is now approaching the 1939 peak. Figures here are for Greater London in its 2001 boundaries. Figures before 1971 have been reconstructed by the Office for National Statistics based on past censuses to fit the 2001 boundaries. Figures from 1981 onward are mid-year estimates (revised in August 2007), which are more accurate than the censuses, known to underestimate the population of London. The largest religious groupings are Christian (48.4%), Muslim (12.4%), Hindu (5.1%), Jewish (1.8%), and Sikh (1.5%), alongside those of no religion (20.7%). 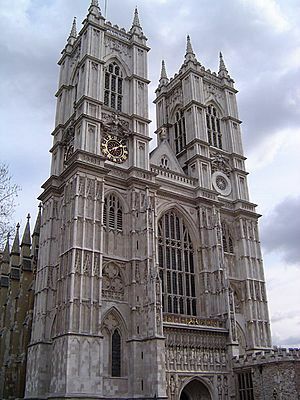 The United Kingdom has traditionally been Christian, and London has a large number of churches, particularly in the City. St Paul's Cathedral in the City and Southwark Cathedral south of the river are Anglican administrative centres, while the head of the Church of England and the worldwide Anglican Communion, the Archbishop of Canterbury, has his main residence at Lambeth Palace in the London Borough of Lambeth. Sikh communities are in East and West London, particularly Southall in the western borough of Ealing, which is also home to the largest Sikh temple in the capital. The majority of British Jews live in London, with significant communities in Stamford Hill (the most Orthodox Jewish area outside New York City and Israel) and St. John's Wood, Golders Green, and Edgware in North London. 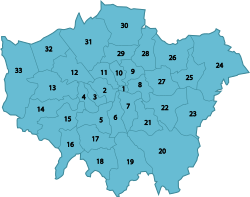 The London postal district does not cover all of Greater London. Areas around the outskirts of Greater London have addresses based on postal towns outside Greater London. University College London, a founding constituent of the University of London. 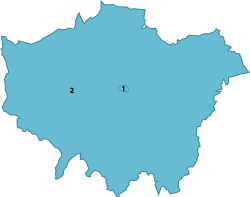 Greater London Facts for Kids. Kiddle Encyclopedia.